•	Removal of existing pavement, and adding a drainable base layer on top of existing sub-layers. •	Resurfacing the pavement to provide a new smooth surface. •	Improving the shoulders and edge drains. •	Replacing rumble strips and upgrading guardrail. This project began in 2017 and included making repairs and replacing guardrail along the bridges. These bridges were built in the 1960s and are showing signs of wear. 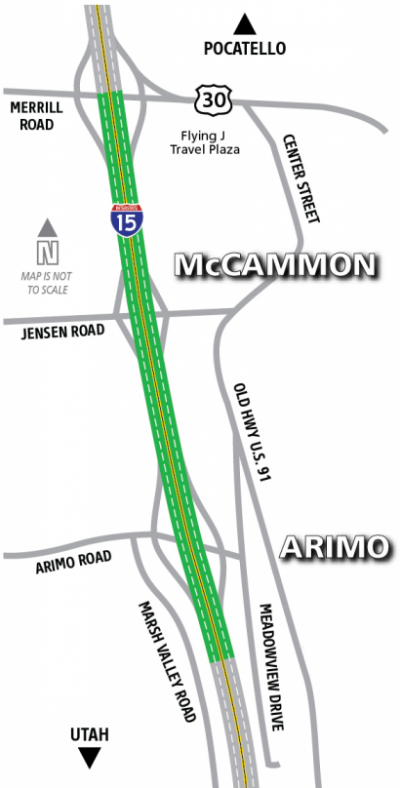 ITD repaired bridges on Interstate 15 between Arimo and McCammon. The majority of these bridges were constructed in the 1960s and 70s. The repairs will protect the structural integrity of the bridges for many years. ITD repaved nine miles of Interstate 15 between McCammon and Inkom. •	Replacing 8 inches of cracked pavement and eliminating soft spots under the surface. •	Upgrading guardrail throughout the project area. •	Repairing Portneuf Bridges near Inkom. 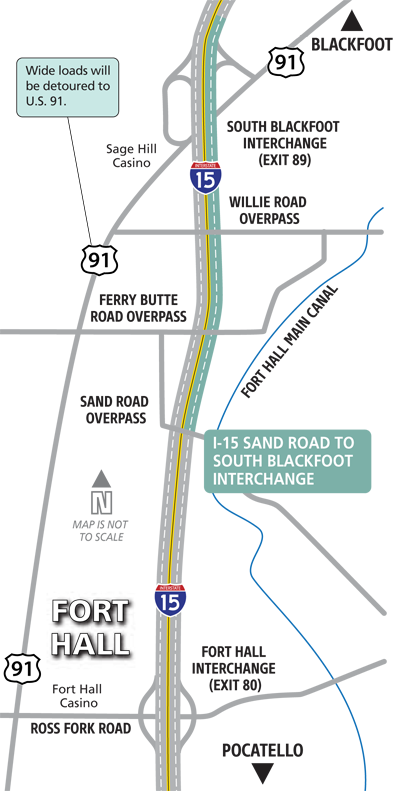 Nearly four miles of northbound Interstate 15 between Sand Road and South Blackfoot were repaved. •	Replacing 9.6 inches of cracked pavement and eliminating soft spots under the surface. •	Rebuilding the vertical clearance under the Sand Road Overpass, Ferry Butte Road Overpass and Willie Road Overpass. 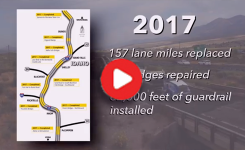 In 2017, ITD’s improvements to Interstate 15 resulted in 157 lane miles of new pavement, repairs to 11 bridges and replacing over 62,000 feet of guardrail. 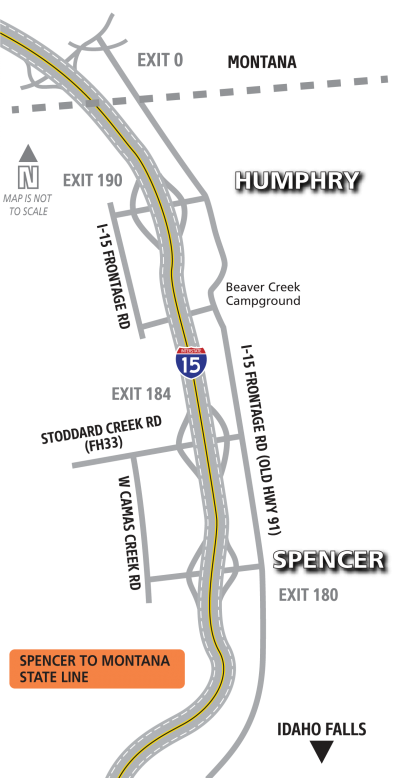 Watch the I-15 wrap-up video covering the 2017 construction projects. 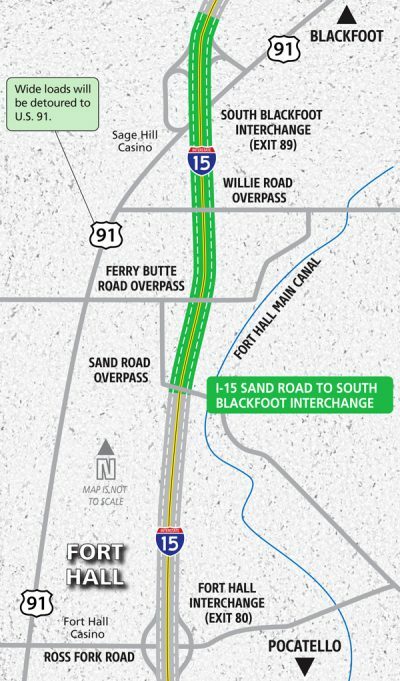 Below are more details about the I-15 projects completed in 2017. 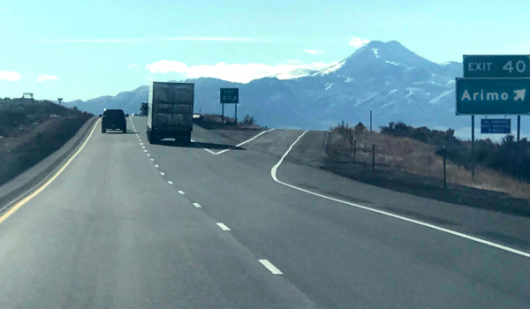 ITD resurfaced 15.3 miles of Interstate 15 between Spencer, Idaho, and the Montana state line in the summer of 2017. The project included repaving ramps and cross-streets at the Stoddard Creek Interchange and Humphry Interchange (exits 184 and 190). 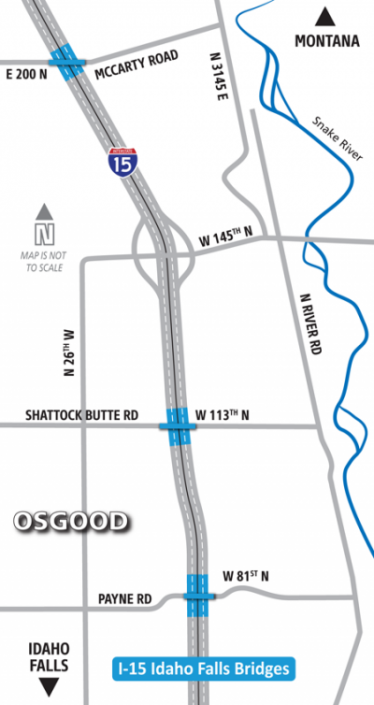 The Idaho Transportation Department reconstructed three of the ramps at the I-15, Osgood Interchange (Exit 128). The Osgood Interchange is located north of Idaho Falls. •	Replacing the northbound on-ramp and both southbound ramps. •	Realigning the ramps to improve sight distance. The work included replacing guardrail, repairing concrete and resurfacing the bridge decks. The project will extend the life of the bridges for many years to come. Lava Beds to Bonneville Co. 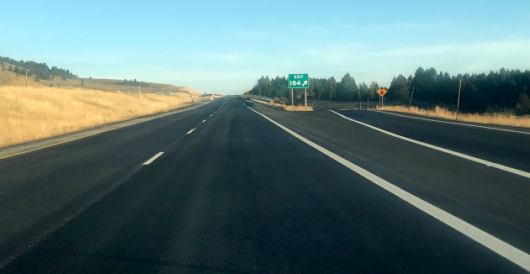 Approximately eight miles of Interstate 15 from the Lava Beds (near the rest area) to the Bonneville County line was resurfaced. 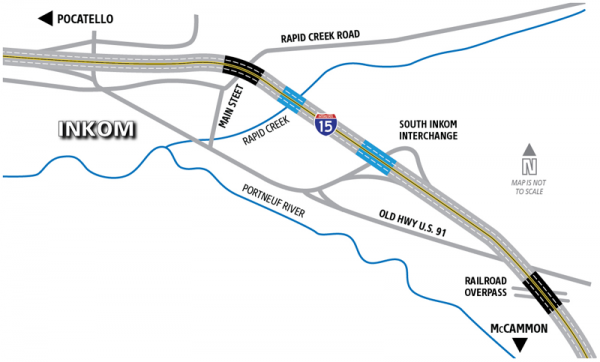 The Idaho Transportation Department resurfaced 3.6 miles of southbound Interstate 15 between the Sand Road overpass and the South Blackfoot Interchange. 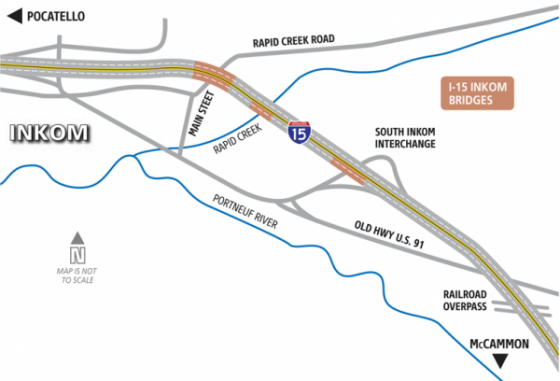 • ITD will return next spring to resurface northbound I-15 between Sand Road and South Blackfoot Interchange. •	Improving vertical clearance under the Sand Road Overpass, Ferry Butte Road Overpass and Willie Road Overpass. 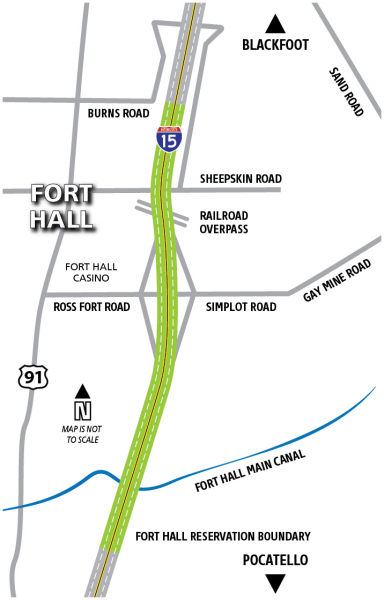 Approximately six miles of Interstate 15 from the Fort Hall Reservation boundary near Pocatello to Burns Road north of Fort Hall was resurfaced. 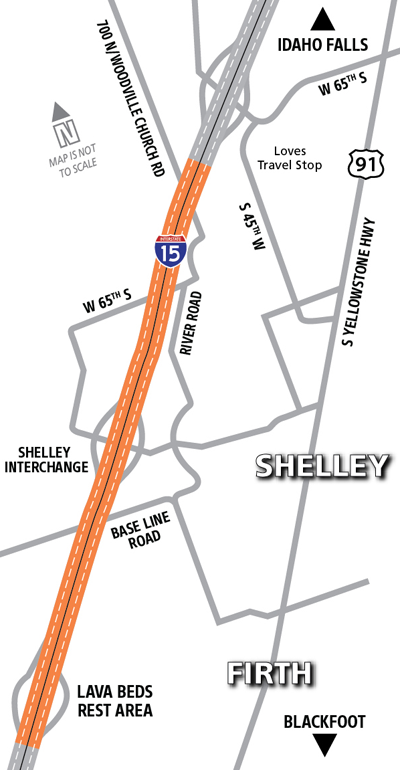 Along with resurfacing, ITD upgraded the guardrail along I-15 and improved the clearance below the structures at the Railroad Overpass, Fort Hall Interchange and Sheepskin Road. • Rehabilitate the Fort Hall Main Canal bridges once the canal is dry. All work to be complete in fall 2017. 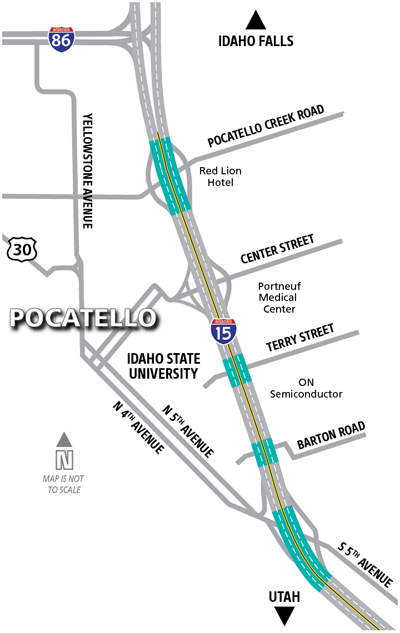 Several bridges on Interstate 15 in Pocatello were rehabilitated. The bridge work preserved the structures and repaired and prevented deterioration. Guardrail along the bridges was upgraded. COMPLETE: Several northbound bridges on Interstate 15 in Inkom were rehabilitated in 2017. • The southbound bridges work in Inkom will begin in the Spring 2018. The Idaho Transportation Department resurfaced approximately seven miles of Interstate 15 from Arimo to McCammon. Along this project route the interstate road surface was deteriorating and needed to be replaced. The work eliminated rough sections and soft spots on the road. ITD also upgraded the guardrail on I-15. Through a method called Cold-in-Place Recycling, ITD reused the old pavement in the new roadway. This method helped to reduce waste and lower costs.